Across The Stars put his Derby disappointment behind him when battling his way to a length and a quarter victory in the King Edward VII Stakes. The 7/1 shot was well-beaten in 10th behind Harzand at Epsom but made amends this afternoon with a performance that his trainer, Sir Michael Stoute, always thought he was capable of. The colt gave Frankie Dettori his fourth victory of the week and his 56th Royal Ascot winner overall, a total which puts him equal with Willie Carson. The jockey revealed after the race that the son of Sea The Stars didn't handle the unique twists and turns of Epsom. "Sir Michael told me that he didn't handle the track in the Derby," said the jockey. "I had a lovely pitch behind Ryan, the favourite (Moore - on 7/2 shot Beacon Rock), and I wanted to use his stride and see if he could come good and he did. "We started quick and then Ryan slowed it up gradually. My arms were getting quite tired so I was pleased when we started picking the pace up at the three furlong pole. "In fairness, the horse came home good. I didn't expect to ride a winner today - I thought it was very difficult. It's nice to get one on the board though - I'm delighted. Michael told me he had this rangy, beautiful stride and to use it. As soon as I got clear, he came home well and ran all the way to the line. "I'd like to pass Willie Carson now! I've had a great meeting so far with four winners - happy days! So far, most of my rides have run to form and I've managed to get some winners." 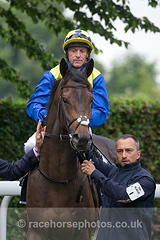 Sir Michael Stoute added "Across The Stars can be a little impetuous but he is growing up. He is a big horse with a lot of development still do both physically and mentally. We have always liked him and I liked the way he battled today. "That was very pleasing because we paid a lot of money for him and he has justified it now. "He has run to a pretty good standard today. I doubt he would stay the St Leger trip so we will stop and have a think." Aidan O'Brien trained both the second and fourth-placed horses, Beacon Rock (Ryan Moore) and Housesofparliament (Seamus Heffernan). Beacon Rock, the 7/2 favourite, made the majority of the running and finished a length and a quarter behind the winner. Third, a head behind Beacon Rock, was the John Gosden-trained Muntahaa, ridden by Paul Hanagan. The Dansili colt, owned by Sheikh Hamdan al Maktoum, was stepping up from maiden company and started at odds of 10/1. Gosden said: "He ran a blinder. He got shuffled back a little off no pace, and with Ryan [Moore] controlling the pace in front and Frankie [Dettori, rider of Across The Stars] handy, he's run the best of all the horses coming from behind, so we're absolutely delighted with him." Royal runner Carntop, who is owned by Prince Charles and Camilla, Duchess of Cornwall, was outside of the places when fifth, after coming through to challenge the leaders in the straight but then fading. The three-year-old Dansili colt, who had run the a close second to Humprhey Bogart in the Lingfield Derby trial last time out, did at least reverse the placings on his Lingfield rival, who was a head back in sixth. Carntop's trainer trainer, Ralph Beckett, said: "He is still an immature horse and his immaturity showed today." Humphrey Bogart's trainer, Richard Hannon, said:" He ran a good race. There wasn't too much space between the lot of them - they all seem to be having their day. "He has run his race pound for pound and hasn't run a bad race and he hasn't let any one down. "Where do we go from here? Probably a step back in trip to a mile and a quarter." Formerly known, and still colloquially referred to, as the Ascot Derby, the King Edward VII Stakes was inaugurated in 1834 and regularly featured horses of both sexes that had competed in the middle-distance Classics. First run as the King Edward VII Stakes in 1926 and now restricted to three-year-old colts and geldings only, it still attracts horses that have competed in the Epsom Derby.